You've got to love it when you arrive home after a long day and notice at the end of your neighbor's driveway is a table with lovely curvy legs in very good condition with a "Take Me" sign posted on it. No twisting my arm. 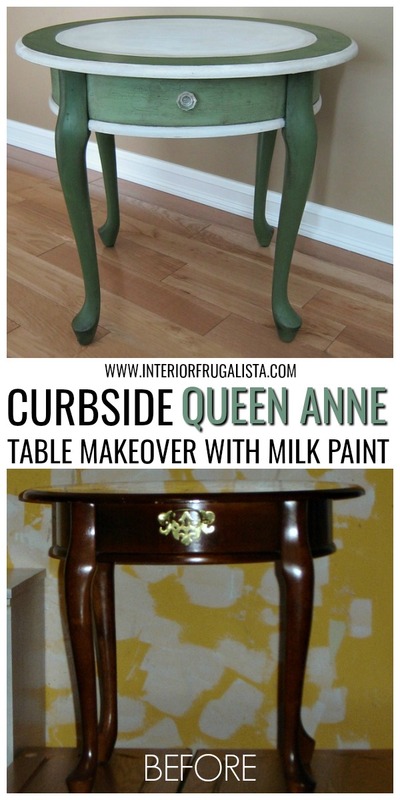 Besides, I had some paint that I was itching to try and so I gave that curbside Queen Anne side table a makeover with milk paint. 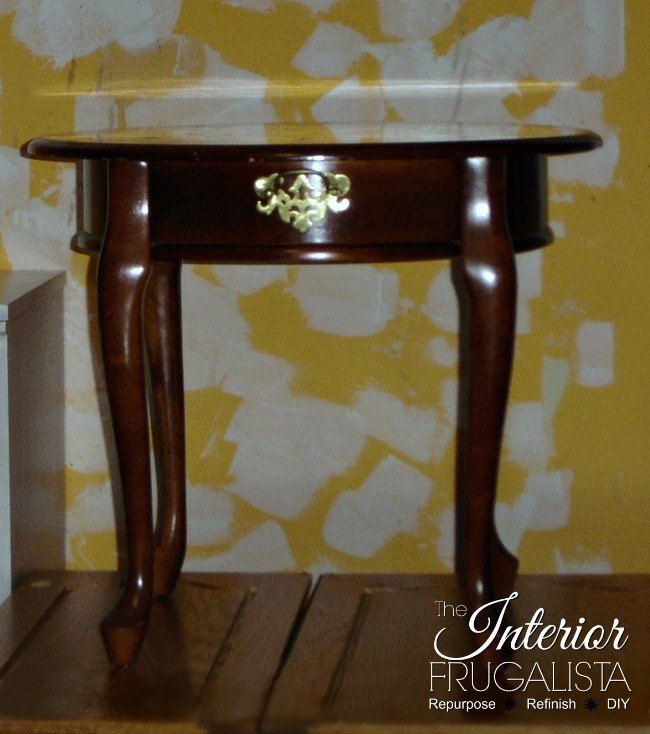 Have you ever painted furniture with milk paint? It sometimes gets a bad rap because it can be unpredictable but that's what I love about it. It chips, it cracks and gives a lovely shabby chic aged patina. 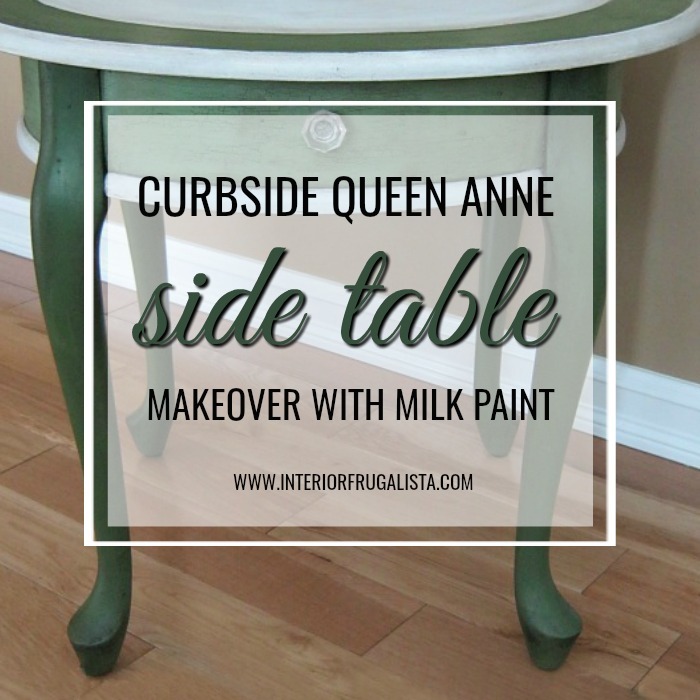 Don't let that scare you because you can control the amount of crackling and chipping and I share how in a detailed tutorial here in my post How To Paint Furniture With Milk Paint. To add to the aged patina, I applied dark wax over the paint so it would highlight that lovely crackled finish. But let's take a look at the table before so you can see how milk paint completely changed the look from a dated high gloss cherry finish to a lovely matte antique aged patina. I must apologize for the poor quality photo taken with an old point and shoot camera and a caffeine-induced shaky photographer. The drawer on the front of the table has a false front. I replaced the original batwing pull with a pretty glass knob to dress it up. 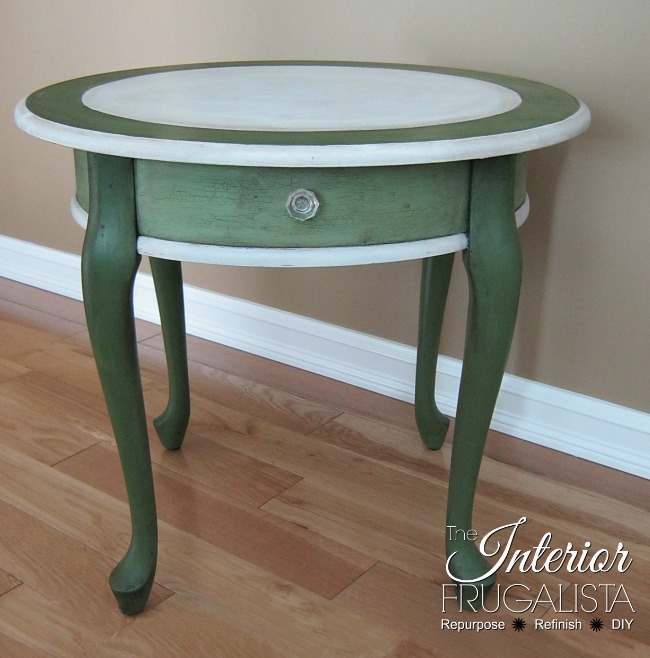 The base of the table was painted with Miss Mustard Seed milk paint in the colors Boxwood and Lucketts Green. 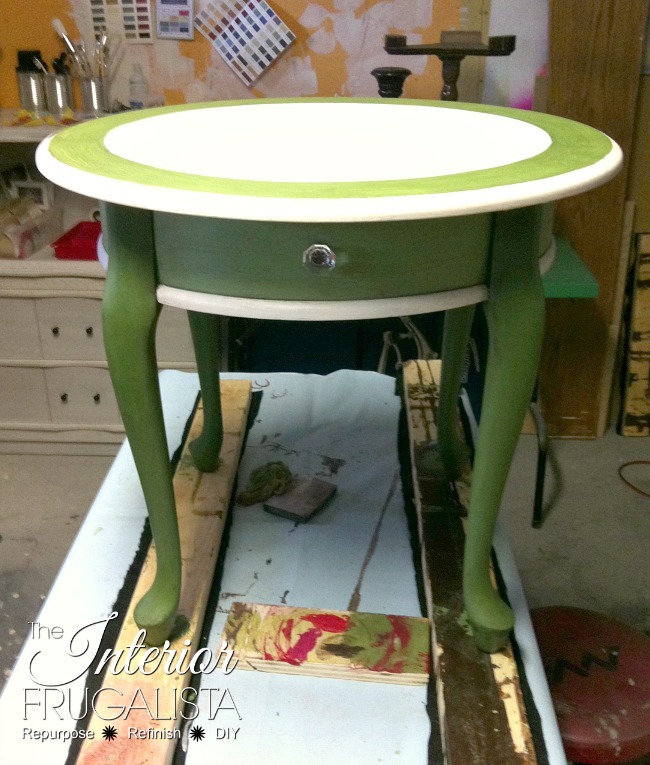 The top of the table and base of the skirt were painted Ironstone white. Inspired to paint a green ring around the perimeter of the top, I measured 4-inches from the edge and drew a pencil line around the table. With an art brush, the band was painted Lucketts green. You can see in the difference in the paint colors from the photo below, without dark wax, to the photo earlier in this post, with dark wax. It deepens the color and gives the piece that aged patina. Again, I apologize for the poor quality photo. I thought long and hard about adding a lovely graphic to the white circle in the middle of the table and probably would have if I was planning on selling it. But it's a keeper and going in my living room where a large lamp will be placed in the center, covering the graphic. I should mention that this is only the second piece of furniture I've painted with milk paint and I'm quite enjoying the process. It's just paint and the beauty of painting furniture is that you can change your mind. 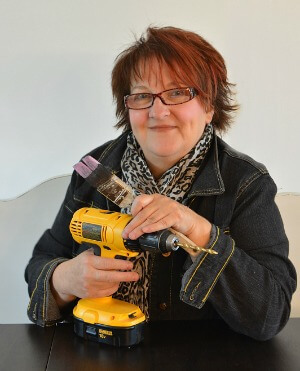 With porous paint, you don't have to strip it if you are reapplying milk (or chalk) paint. Plus you can paint right over that beeswax finish like I did...ahem...a couple more times. As sometimes happens, after living with this table for several months I wasn't 100% happy with the makeover because it reminded me of a frog. 🐸 I gave the table a second Curbside Table Makeover With Parisian Flair here. Ahem, guess what? I changed my mind AGAIN. Yup, the third and final Queen Anne Clock Face Table With An Identity Crisis makeover and this time I sold it. Curious minds need to know, was the last makeover your favorite? 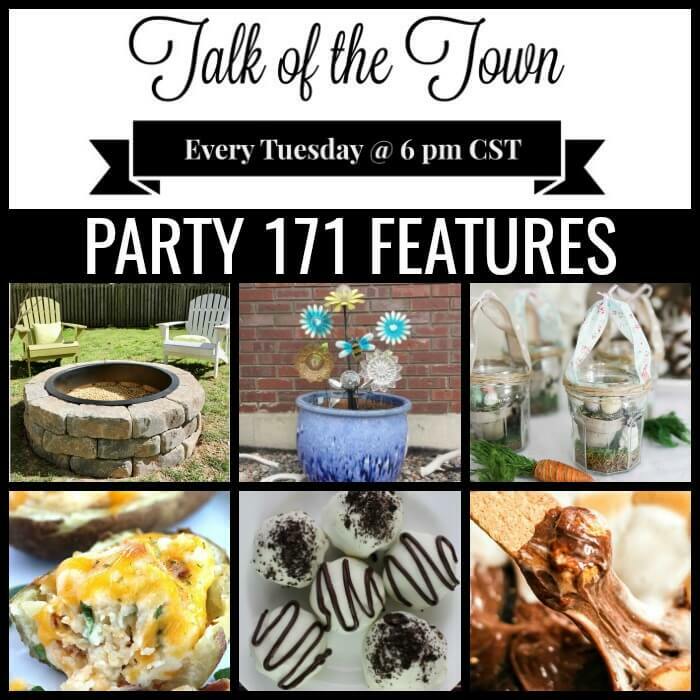 I'd love to hear what you think in the comment section below. I am I love with this table! 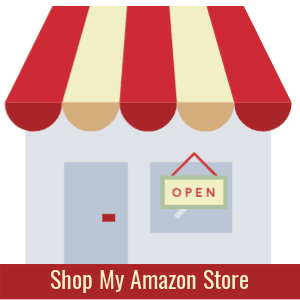 Do you sell your completed work? Thank You! This is a table I've done for myself but I do plan on selling pieces soon.